I had the same surgery as Princess Eugenie- and her wedding dress will change the world for many girls. I had the same surgery as princess Eugenie as a teen and have the same scar. 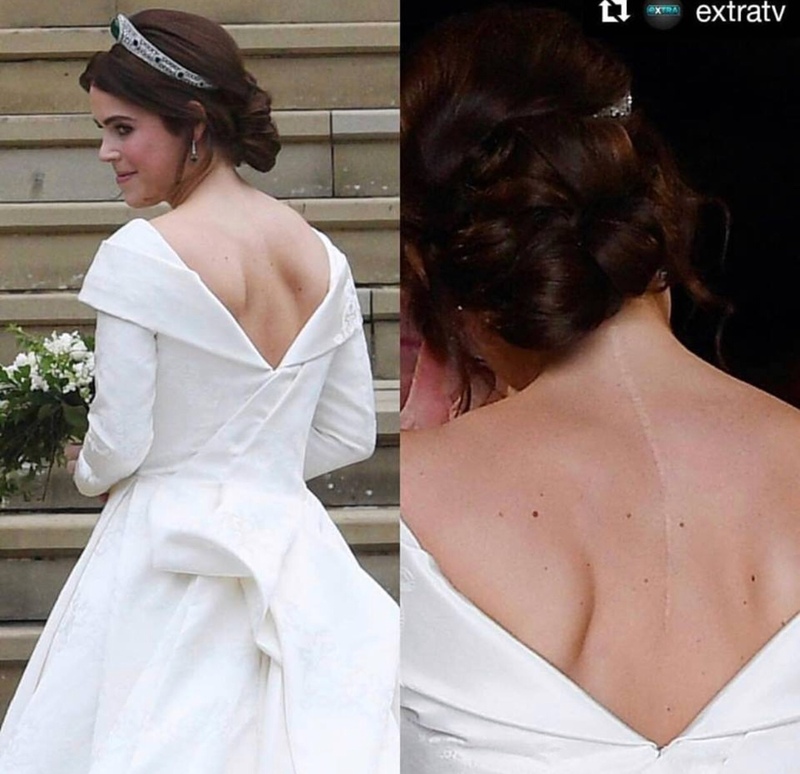 Having seen the commentary of The #royalwedding there is one detail all Mums of kids having this surgery and anyone Who is self-conscious about surgical scars need to see- The fact that she not only didn’t try to hide a surgical scar but deliberately designed her dress to show it off. Princess #eugenie was the image of a fairytale princess as she stepped into Saint Georges chappel to marry the love of her life. With a plunging back dress and no Veil highlighting an elaborate train commentators gushed over the gorgeous train, tiara and wasn’t until much later that the reason for no Veil was revealed. 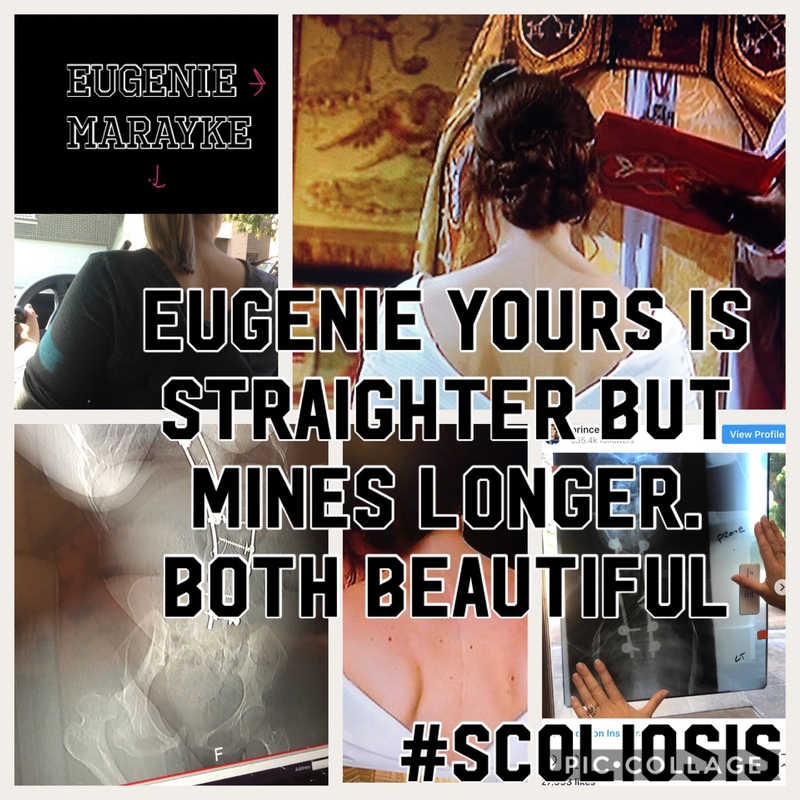 Eugenie had surgery at age 12 for scoliosis, curvature of the spine, and has a scar as a result. The honest truth is I’m not sure anyone would have noticed her scar if she hadn’t called attention to it by alleging broadcasters it was a deliberate design feature of the dress. To redefine the way we think about beauty she says she designed her dress to display the scar and eschewed wearing a Vale which would hide it. This small act is more then simple fashion it will change the lives of people all over the world- especially children like I was as a teenager when I had the same surgery. Feeling confident about ourselves and our own bodies is crucial or anything we want to do achieve and be in life, and developing self-esteem issues around scarring can lead to mental health problems social withdrawal, not participating in sport or activity is way your body might be revealed even refusing to have the life-saving treatment. 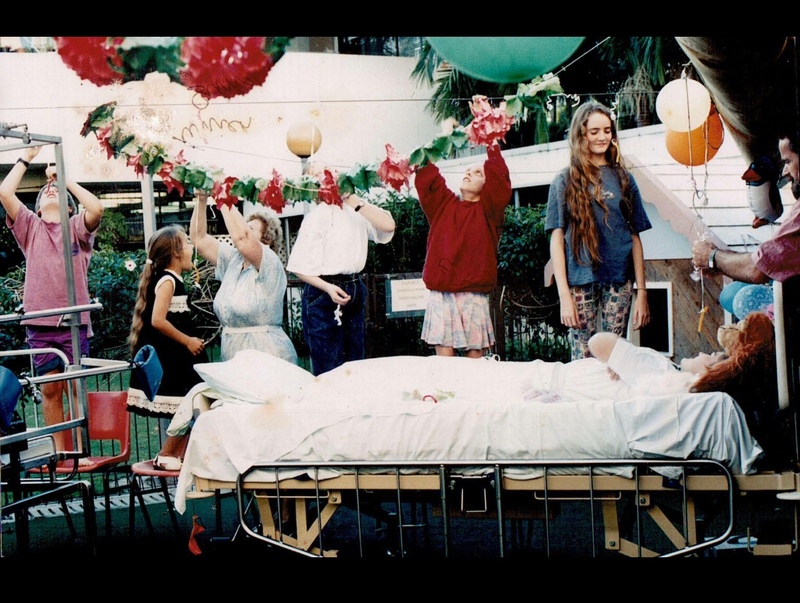 The last thing happened the night before my surgery was my mum took photos of me “ with my normal body, before it was Scarred”. After over 10 hours in surgery and being sliced from the neck to the tailbone having the spine manipulation, artificial or donnor bone wedged in between the vertebrae and anchored in place with metal rods I work up in intensive care with tubes coming out of every orifice I could think off. I was not allowed to sit up eat or move. Six months later I had two more surgeries where an incision was made through the front starting on my left flank and continuing all Accross my stomach on a diagonal. This was to allow access to the spine from the front and my lung was deflated and additional metal rods placed in the front of the spine. Until all surgeries healed I had to wear a full body brace, which I had been wearing since a young child anyway to prevent because getting bad before puberty when surgery was possible. It wasn’t a pleasant experience but most surprising thing was the lifelong impact has nothing to do with the surgery but people‘s perception of the scars I carry as a Mark of this story in my life. I was a competitive swimmer to represent my school for Queensland at national championships and one-day the Paralympics when the surgeries were performed. At age 18 my friend started wearing bikinis . Not only was it slightly sexier it made sense in the hot Queensland weather, we got less tan lines and and I have broad shoulders which were a different size chair my lower half so buying a two piece swimsuit was what I wanted. I had my own drivers license so I went shopping for my first time so that didn’t hide my scars. I never imagined the media to turn up at training the First day I wore it and end up on the front page of the newspaper. That front page of the newspaper wearing a bikini and hearing people are saying wow you look hot in that photo was such a turning point for me, having spent The previous six years since my surgery being told I should be self-conscious about the scars and encouraged to hide them. Unlike Princess Eugenie my scoliosis surgery story didn’t end in my teenage years. Three years ago I had emergency surgery to remove part of infected scoliosis rods and surrounding bone, after tripping over a dog and developing a system of infection and osteomyelitis through the cut in my foot. 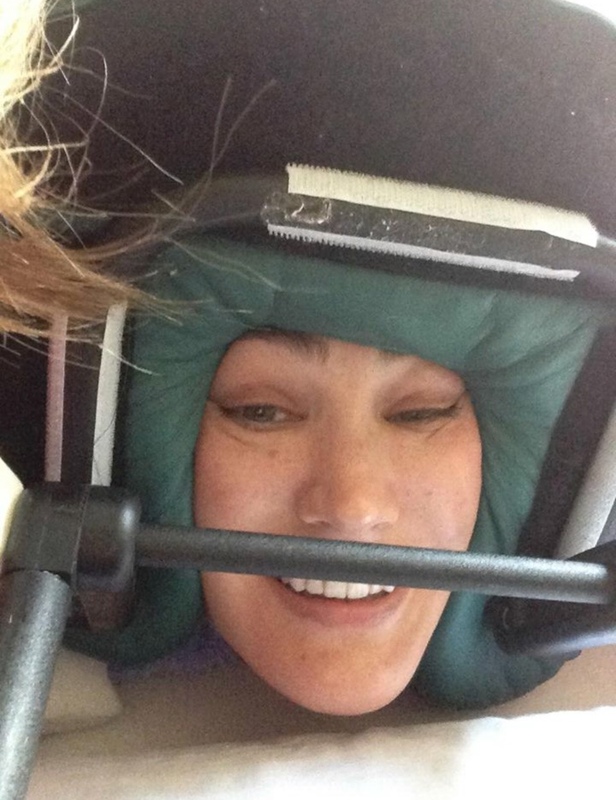 Not only did I spend a year in an out of hospital and three more surgery, I had to lay face down to protect my spine while my face swelled up like a balloon in this contraption designed to keep the body completely flat until the spine stabilised and the incision on my back was healed enough to lay on. And yet again I was concerned because I woke up to find an hour had a horizontal ska making a T intersection with the vertical one. In reality of course I’m much more glad that I’m alive with the scar but it is a sad reflection on a current society that being worried about Scott enters your mind as you wake up from life-saving surgery rather than the fact that you are going to be better and have your life back. Today Princess Eugenie wedding has been the international equivalent of that Sunshine Coast Daily Front page of me in the bikini-encouraging the world to focus on body positivity and see the beauty Beyond a scar. I hope parents of children who are having their scoliosis or other surgery now see Eugenie, me and many others who live with scars from life saving surgeries and realise it’s Not ugly but a part of your life story. We don’t need to hide it. 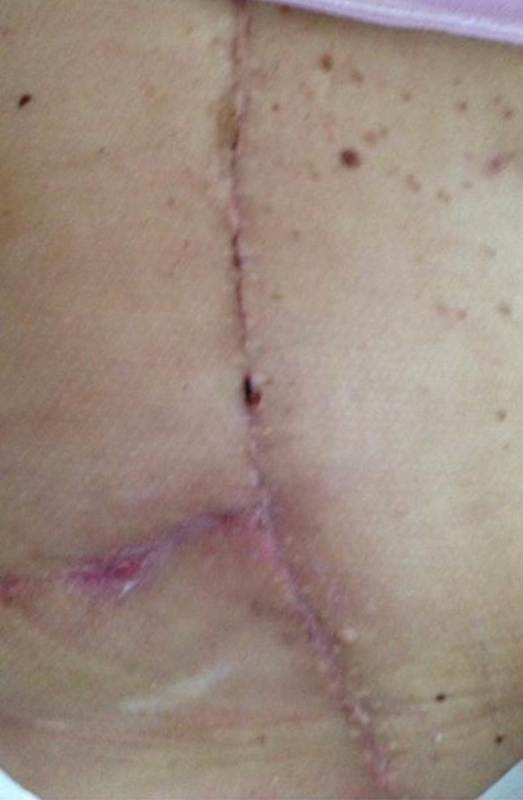 Surgery can be scary enough without being worried about having a scar afterwards. One-day I hope that as a society we evolve to the point where we aren’t so vain thatsomebody getting married in an outfit which doesn’t completely hide or even shows off scars won’t even need to be global news. People have surgeries every day-from Caesareans to bring life into the world, to save lives after accidents and to improve polity of life. Having a cigar means you are a survivor. It doesn’t make you any less beautiful any less deserving of being loved or treated like a princess. Be part of the solution. Love your body. If you have scars remember they are the roadmap telling the story of your life and everything you’ve been through become who you are today. Change your children it’s okay to be different, scales are part of life. And please don’t tell your children to cover up. I feel a #body positivity revolution coming on!! Do you have a photo of a scar you are comfortable showing? Why not Share it on social media ?